The last section of the report includes a competitive dashboard, key developments, SWOT analysis, and financial analysis, which include market share analysis and provide information and analysis of major players based on the categories of manufacturers and service providers across the value chain and their presence in the global market for isoparaffin solvents. To understand the market trends and opportunities of the market for isoparaffin solvents, the global market has been segmented on the basis of applications and product type. To figure out the market numbers for isoparaffin solvents, we have considered 2017 as the base year. The initial phase of the research involved the formulation of a preliminary hypothesis, which was followed by the data collection stage that comprised of both, primary and secondary approaches. The subsequent stages involved triangulation of data gathered from the two approaches. The basic data of isoparaffin solvents was collected from various sources such as annual reports of manufactures, end-users, distributors, government directives and public data sources, among other sources. Both, supply side and demand side drivers and trends were considered to forecast the isoparaffin solvents market. In the next stage of analysis, the collected data was distributed on the basis of different verticals. This base year information was further segmented across categories as mentioned in market taxonomy and analyzed the overall market size of isoparaffin solvents. Then, that data was validated where the market assessment was deduced from the hypothesis model. 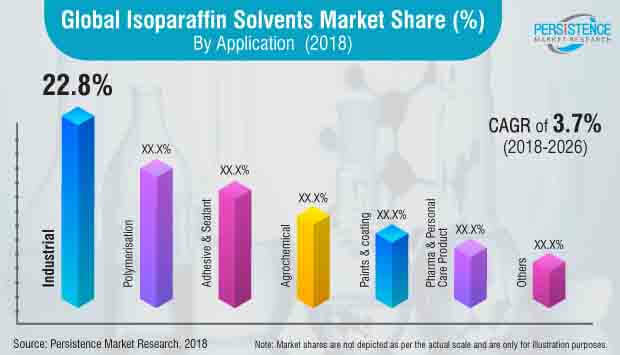 The isoparaffin solvents market report also analyses the incremental $ opportunity and global absolute dollar opportunity. Volumes derived pertaining to isoparaffin solvents were refined on the basis of responses obtained from industry participants. The responses obtained were weighted in order to refine the data and validate assumptions associated with the assessment of the market size. Moreover, numerous factors were taken into consideration while forecasting the price of isoparaffin solvents. In pricing analysis, the weighted average price of the commercially-available grade was calculated & a forecast was derived through our proprietary forecast model. Isoparaffin solvents are branched-chain aliphatic hydrocarbons (molecular formula CnH2n+2) obtained through crude oil distillation. Generally, paraffin compounds are arranged in two forms, i.e. straight-chain (n-paraffin) or branched chain (isoparaffin). Isoparaffin solvents are frequently produced through the distillation of crude oil during the refinery process. To obtain the pure grade of isoparaffin solvents, few processes are carried out, such as distillation, catalytic cracking, etc. However, these solvents have better fuel characteristic properties as compared to normal paraffin solvents. Moreover, isoparaffin solvents find various applications in metalworking, industrial cleaning, chemical, paints & coating, adhesive & sealant and polymers industries. They are also used as an intermediate, cleaner and solvent in other industries. Moreover, isoparaffin solvents are also applied in various application areas, such as water treatment, chemical synthesis, electronics appliances, wax cleaners, printing inks, etc. These solvents have better solvency, high flash point and boiling point and high flammability. They are costlier than paraffin components and this may prove to be a challenge to their adoption among consumers. The incremental $ opportunity created by the market during the forecast period is pegged at nearly US$ 51.9 Mn. The isoparaffin solvents market is expected to expand at a CAGR of 3.7% during the forecast period. Key vendors in the market are opting to offer isoparaffin solvents that are tailored to cater to specific end-use requirements. The market participants prefer to offer high value-added solvents to gain share in the market. Total S.A. offers the ISEAN range of isoparaffin solvents, primarily for paints, resins and metalworking applications. Idemitsu Kosan Co., Ltd, one of the prominent participants in the isoparaffin solvents market, offers IP 1620, which finds applications, primarily in paints and coatings. Product specifications and wide application areas will drive the growth of the global isoparaffin solvents market in the coming years. The global market can be segmented on the basis of application, product type and region. On the basis of product type, the global market have been segmented into five segments: C4-C8, C9-C11, C12, C13-C14 and C15<. On the basis of applications, the global market has been segmented into seven key segments: paints & coating, industrial, adhesive & sealant, pharma & personal care product, agrochemical, polymerization and others. On the basis of geography, the global market has been segmented into seven regions: North America, Latin America, Europe, Middle East & Africa, China, Japan, and South East Asia & Pacific. Isoparaffin solvents market players have medium to good presence across the globe. Generally, isoparaffin solvents are utilized in industrial applications for cleaning, metalworking and degreasing. Rapidly increasing industrialization in emerging markets of China, India and ASEAN countries across the SEAP region will create high demand for isoparaffin solvents over the forecast period. Moreover, high growth in end-use industries, such as automotive, adhesive & sealant, agrochemical, polymer and other industries, will also push the growth of the global market. The initial phase of the research involved the formulation of preliminary hypothesis, which was followed by the data collection stage that comprised of both primary and secondary approaches. The subsequent stages involved triangulation of data gathered from the two approaches. Initially, the basic data collected from various sources, such as annual reports of manufactures, end-users, distributors, government directives, public data sources, among others, was evaluated. Historical data in terms of solvent production and consumption from 2013 -2017 was considered as basic data for further analysis. Next, both supply side and demand side drivers and trends were studied to forecast the isoparaffin solvents market. Some of the players covered in this study on the global isoparaffin solvents market are ExxonMobil Chemical, Royal Dutch Shell Chemicals, Idemitsu Kosan Co. Ltd, RB Products, Braskem, Chevron Phillips Chemical Company, Total S.A., Mehta Petro Refineries Limited and Maruzen Petrochemical CO., LTD.